Although entrepreneurs have many striking qualities some of which include risk-taking and determination. They face many difficult challenges along the road to success. Failure is not the opposite of success, it’s a part of it. You will definitely run into problems, however, as an entrepreneur, you must not get discouraged and should keep charging forward despite all the challenges that come your way. 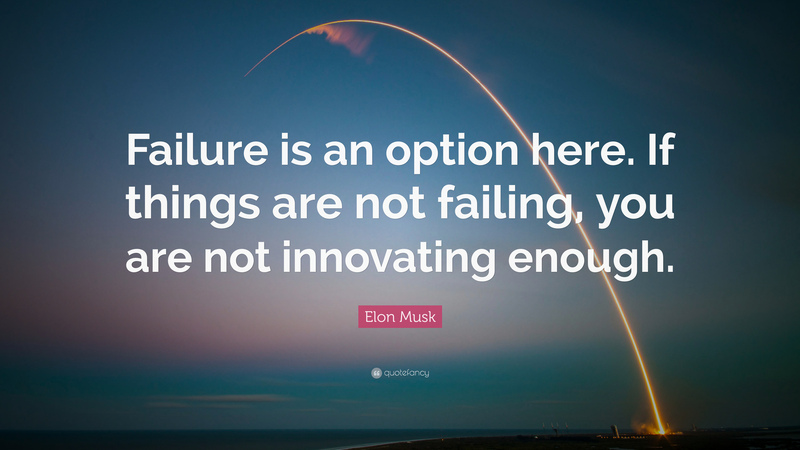 Elon Musk, one of the most successful entrepreneurs worldwide who’s net worth is 20.5 billion dollars and owns several companies such as Tesla™ and SpaceX™, failed many times during his career yet all those failures is what made him successful today. Taking his failures as an example of a tough journey to a successful end, we can look at many examples of his difficulties and see how he kept charging on and didn't let any failure/problem phase him. In 2008, struggling Tesla nearly collapsed during the financial crisis. When Tesla needed cash to fund the Model S, Musk chose to bankrupt himself — giving up the money he earned from his success with PayPal (a company he sold)— rather than let it die. He sunk his last $35 million into the company. On February 23, 2010, in a court filing, Musk admitted he was broke: "About four months ago, I ran out of cash." The filing, part of his divorce case from his now ex-wife, Justine Musk, said he had been living off of personal loans from friends since October 2009. Today Tesla is one of the most successful niche car companies in producing electric cars, all due to the fact that Elon Musk persevered and was determined to keep the company alive. It wasn’t until April 28, 2016, for SpaceX to achieve the first of three consecutive successful landings on the drone-ship. The try in June for four in a row ended with the rocket in flames, however, this did not discourage Elon Musk and his crew as SpaceX. They instead took these failures and analyzed them to learn from their mistakes instead of being discouraged. Engineer Kate Tice might as well have been speaking for Musk when she offered this take on the failure: “Important thing to keep in mind is that we did receive a lot of really good data from this[SpaceX failure].” SpaceX’s failure didn’t stop Musk from envisioning the future and “sending people to Mars by 2024”. "I think if you're going to choose a place to die, then Mars is probably not a bad choice," he said. In sum, despite all failures and destroyed rockets Musk’s motivation, perseverance, and risk takings are the reason why he is still working towards his goals with high motivation, in addition to being a successful entrepreneur and a role model. E-commerce in Egypt: A paved or a bumpy road?